Quite some time ago now, I mentioned in the post about the Post IPP California Puzzle Party that I'd purchased a copy of Dave Rosetti's exchange puzzle from IPP31 and that I'd write a review soon. It seems that soon wasn't very soon at all and it's taken me months to get round to writing it! 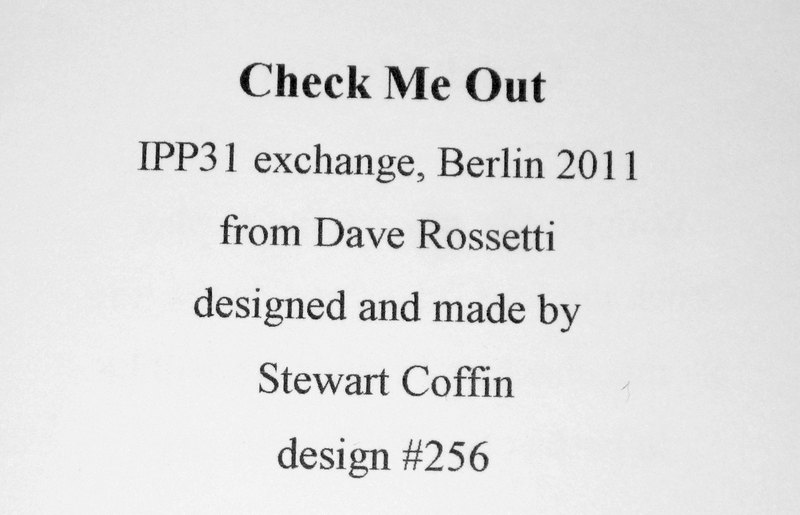 But here at last is the review of 'Check Me Out' designed by Stewart Coffin, and numbered 256 in his numbering system. The Puzzle itself is fairly plain. 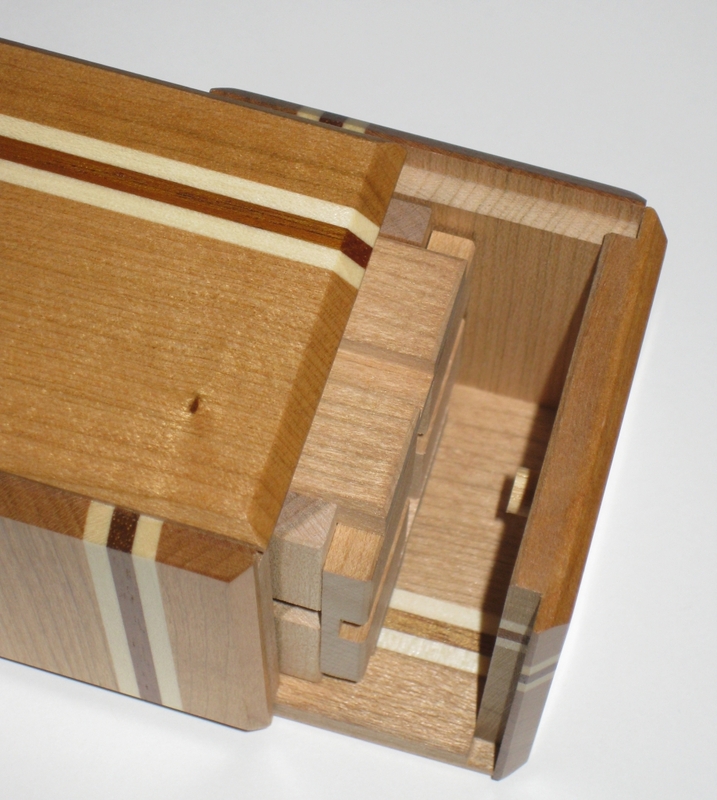 There's no exotic woods used here (possibly Maple for the lighter wood), and the base of the tray is made from a veneered 3 ply plywood. That said, the grain in the veneer of the base of the tray is nice enough and gives a good contrasting colour to the pieces. Add to that the fact that the grain is offset to the angle of the walls of the tray really helps to mess with your head as you're solving it. The bottom of the tray is marked in pencil "256 STC 2011". 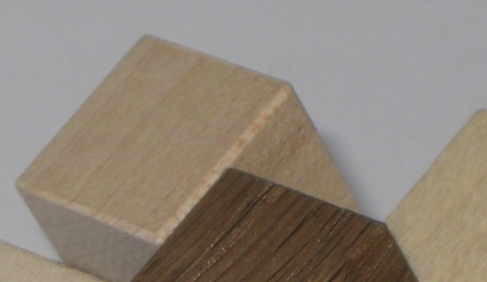 Each of the four pieces is very accurately cut and has had the corners rounded very slightly to take the sharp edges away. 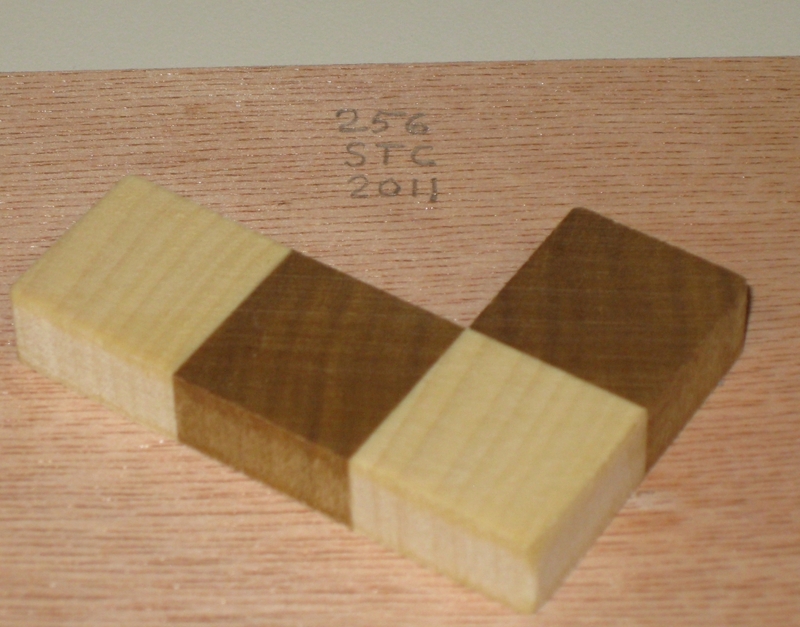 It's a small detail, but as a fellow puzzle maker pointed out to me when I started making puzzles, it really does make the puzzle far nicer in the hands when you're solving it. Solving this one really took quite a while for me. 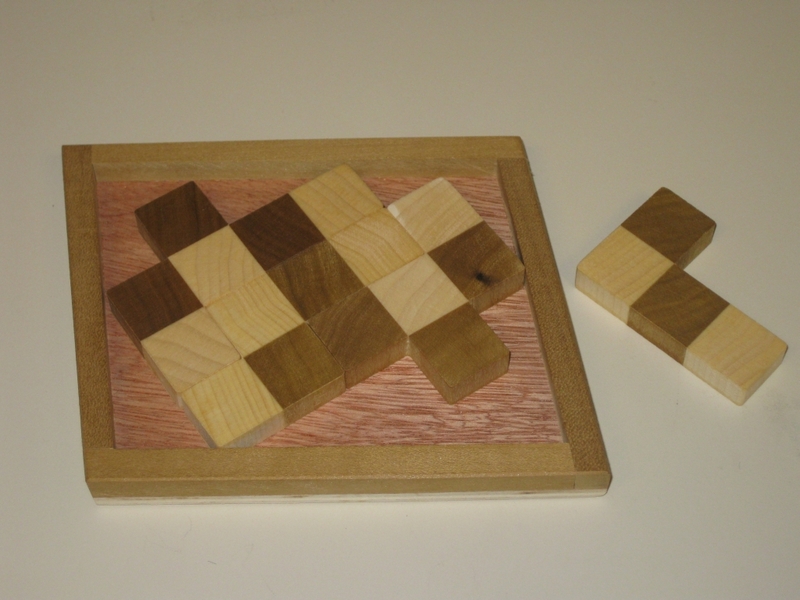 I spent several hours trying to find a combination where all four pieces could fit in, ignoring the symmetry part of the problem. 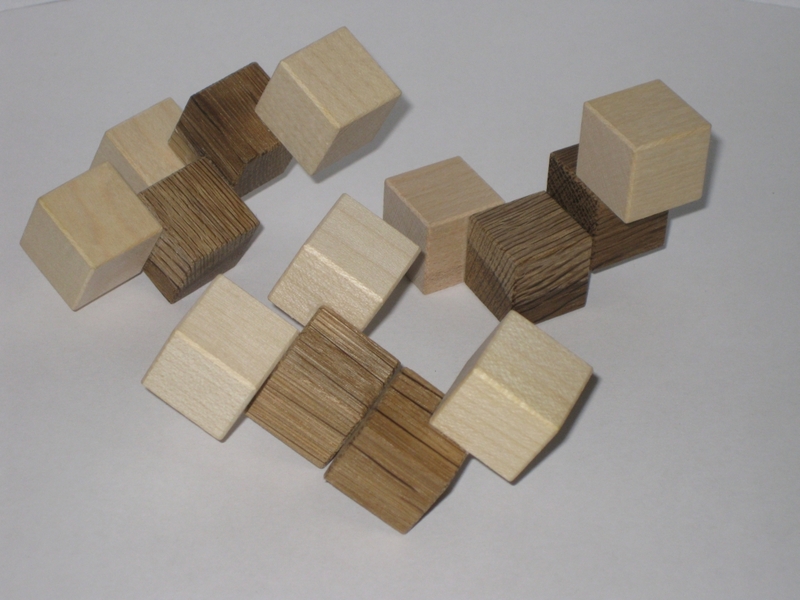 This is an excellent puzzle that will likely keep you busy for a long time. Who would have known that four pieces could provide such a problem to placing them in a tray? I'm not going to post the solution here, as that would spoil the fun. If you're really stuck, then drop me a note and I might help you out by letting you know where one or two of the pieces go! 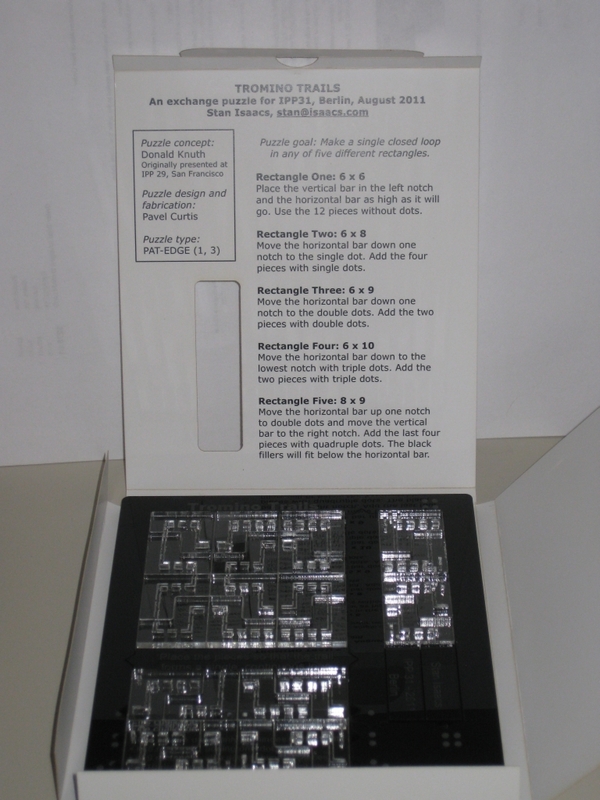 Carrying on with my review of IPP31 puzzles, here's another of the puzzles that I picked up when I was at the recent Post IPP California Puzzle Party. 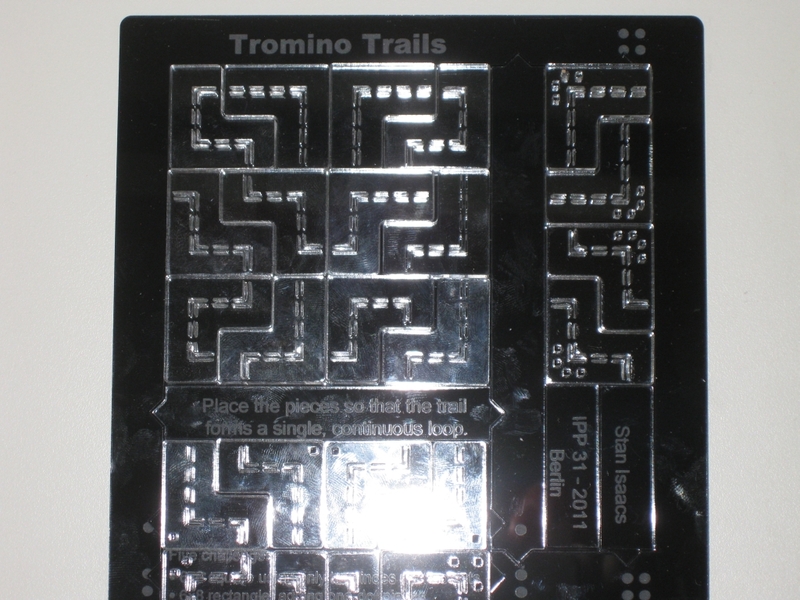 Tromino Trails was Stan Isaacs exchange puzzle from IPP31, and given that Stan was the host of the Puzzle party, it would have been rude not to buy one of his puzzles. 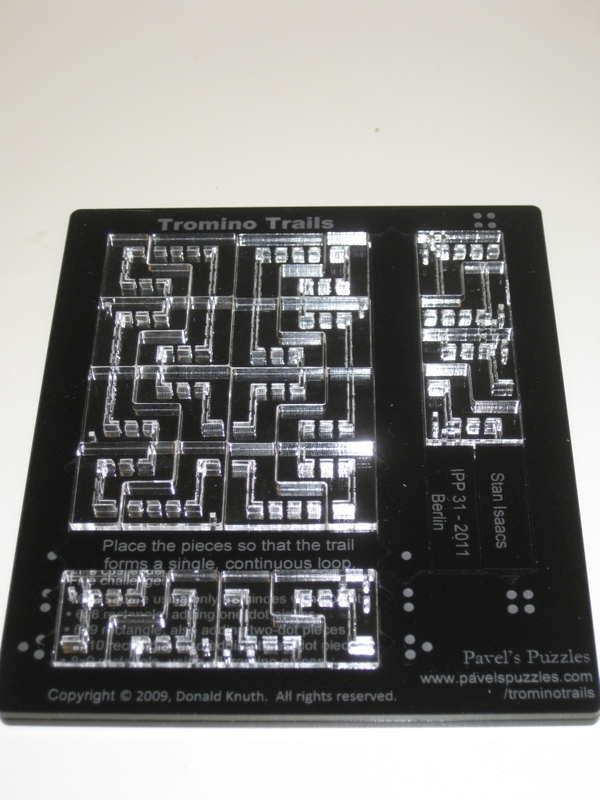 Tromino trails is designed by Donald Knuth and made by Pavels Puzzles. 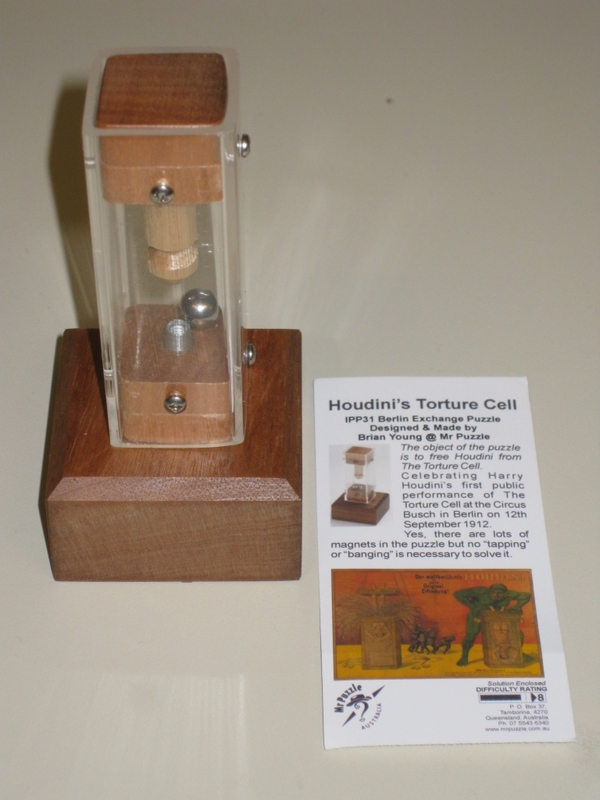 You can read Pavel's description about the puzzle by following the link, and also purchase a copy for yourself if you'd like one. And I highly recommend you do! 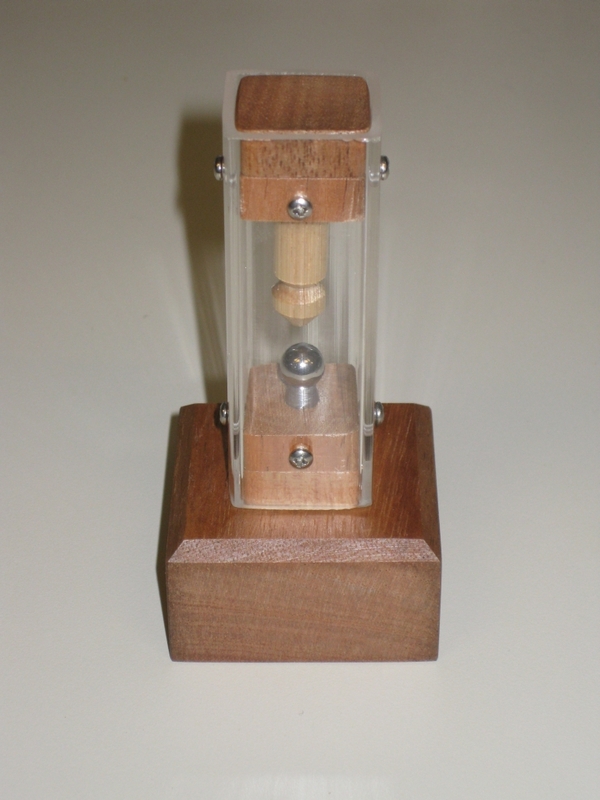 This puzzle goes back to 2009, and IPP29 in San Francisco. There Donald Knuth gave a talk about varying puzzles he was working on and passed out a sheet with some puzzle problems that people could play with later. 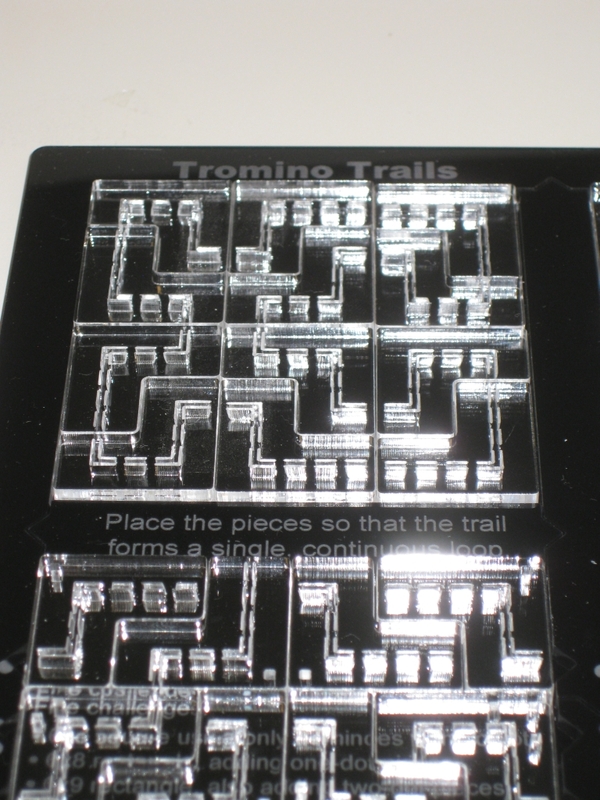 One of those problems was the Tromino Trails problem. I'll let you read about it on Pavel's site, as he was there and will explain it far better than I. 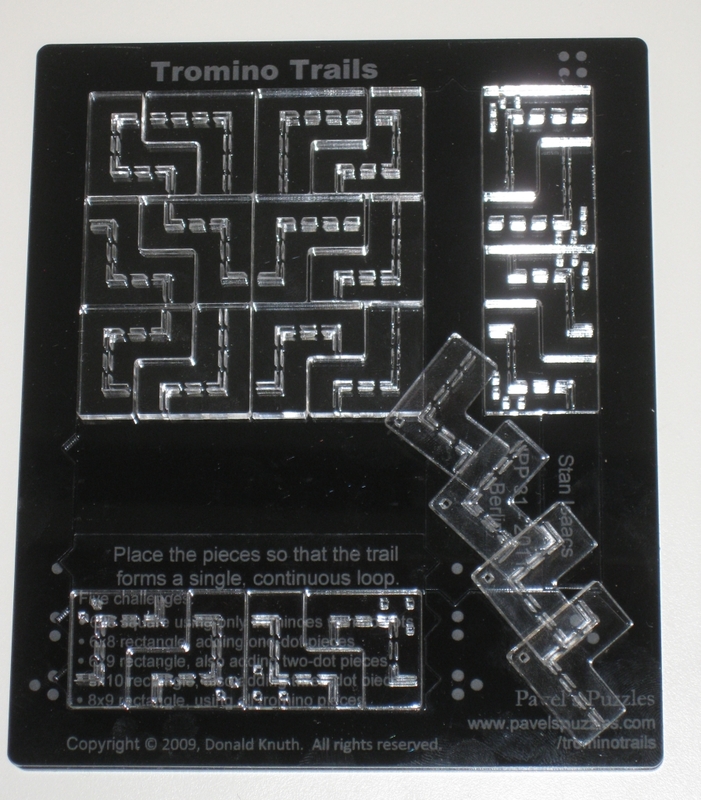 However I digress.The Tromino Trails puzzle is a physical version of Don's paper problem from IPP29. 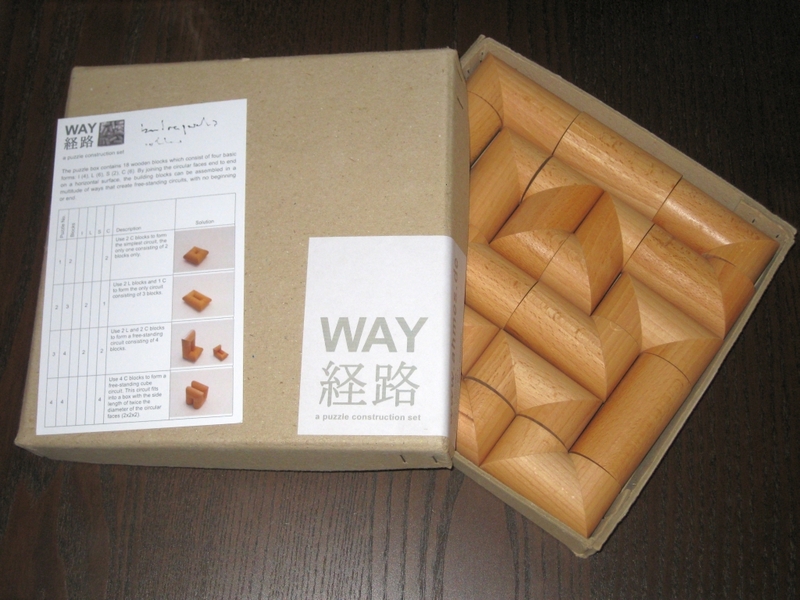 The puzzle consists of 24 L shaped trominoes with varying paths marked on them, a tray that can be configured to a number of different sizes and five challenges. 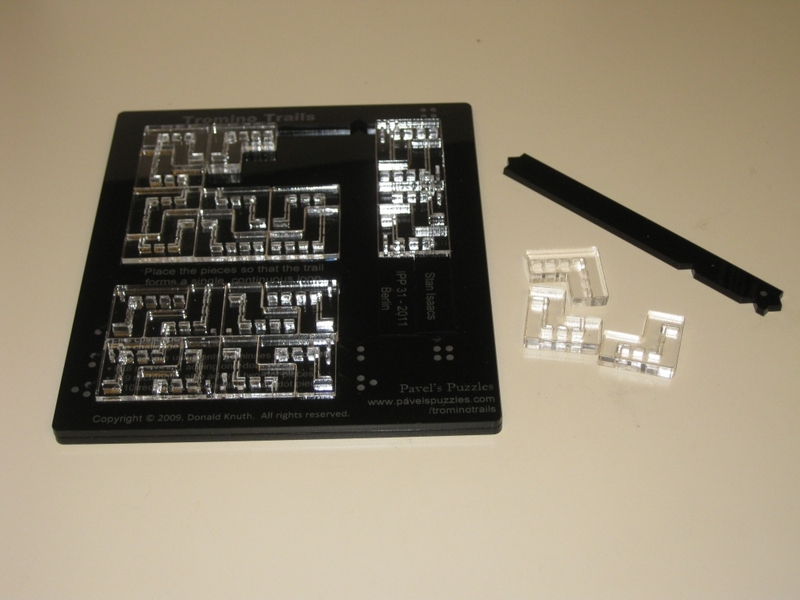 You start off with a 6x6 square, and 12 pieces, with the goal being to fit the pieces into the tray and form an unbroken loop with the trail marked on the pieces. There's a single unique solution to the problem. Given that the tiles are transparent, the trail is visible on both sides, and therefor can be flipped over and rotated as desired. The 6x8 challenge and pieces marked with one dot. You then move a few bars around and get a larger 6x8 tray, add four marked pieces, and have the same goal of an unbroken loop. Again this problem has a unique solution. Moving the tray around is easy as the spacers all have tabs on their ends that fit into notches in the tray and have a number of dots based on the challenge you're attempting. A great idea and really well thought out. Next up a 6x9 tray created by moving more black frame pieces, and two new trominoes. Same goal, same unique solution ... are you seeing a pattern yet? All five challenges, add progressively more pieces, and a bigger tray until you're using all 24 trominoes, all with unique solutions, and you have a beautiful, and elegant puzzle design. I think the nicest thing about this (given that we know I'm not good at tray packing puzzles) is that this one is really approachable. I've been able to solve all five problems, and none of them are too difficult. Yes they're a challenge, but not such that you get frustrated and want to throw the puzzle across the room. 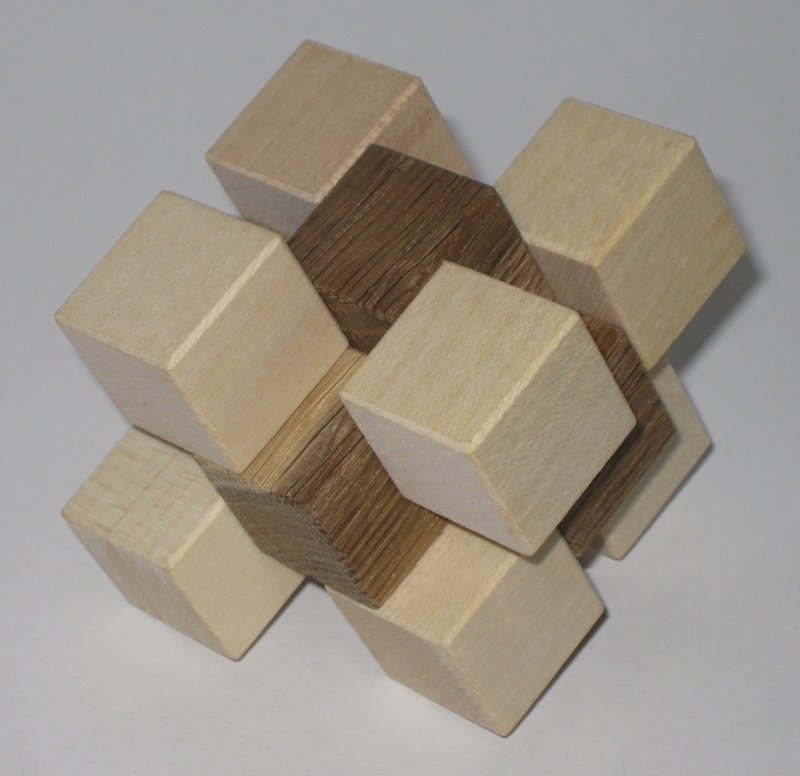 There's no solutions provided, but if you are stuck, or just curious, then click the 6x6 solution link or the 6x8 solution link to see the solutions. After that you're on your own. After all, what's the point in my giving you the solution. This is actually a fun tray puzzle! At IPP 31 in Berlin George Bell exchanged his Three Piece What 'sit made by Bernhard Schweitzer in the New Pelikan workshop. 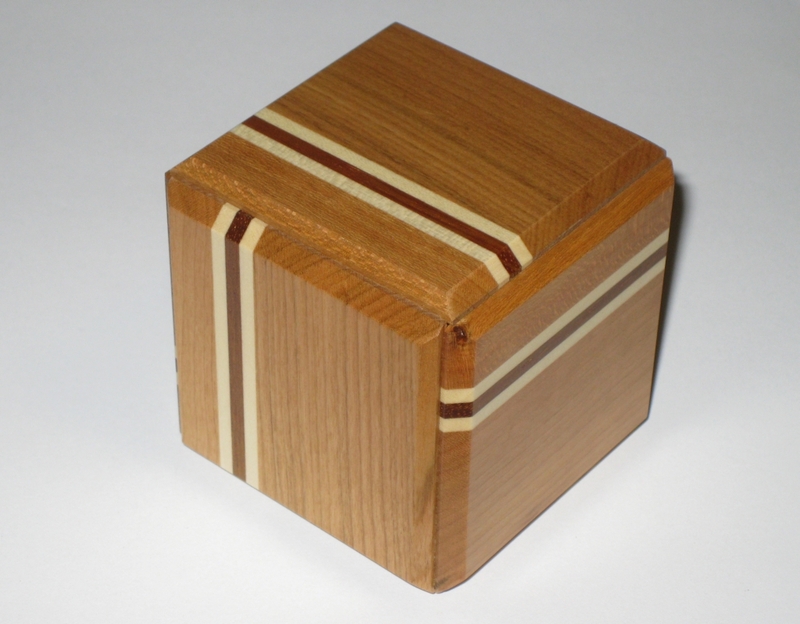 The goal, and the only hints you get are to "Assemble the 3 pieces to an allside symmetrical 3D shape"
This great looking puzzle is made from Maple and Robina and measures 2.75" x 2.75" x 2.75". 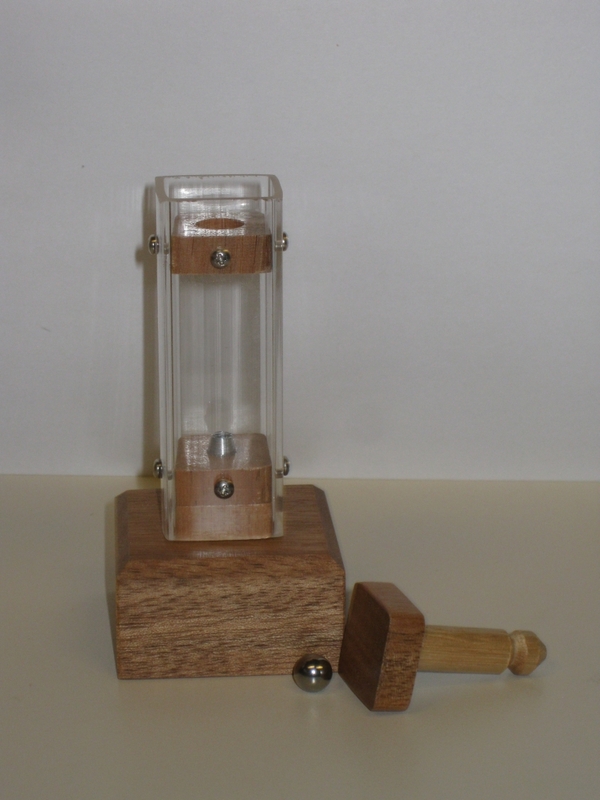 The three pieces are a good size in your hands and give little away about how they should be combined. Playing around you'll quickly find several ways that two of the pieces can be joined, which leave no room for the third to fall into place. I probably spent around 10 minutes before I found the correct orientation of the first two pieces to allow the third to drop into place correctly, leaving a very pleasing solution shape. Taking it apart and photographing it for the review, it then took me around another 10 minutes to get it back to its solved state again. Since then I've taken it apart and put it back together again several more times, and I can solve it fairly reliably now. I'm sure if I left the pieces separate for a while then came back to it, it would take a little time before I could solve it again, so the level of difficulty is reasonable on this one. 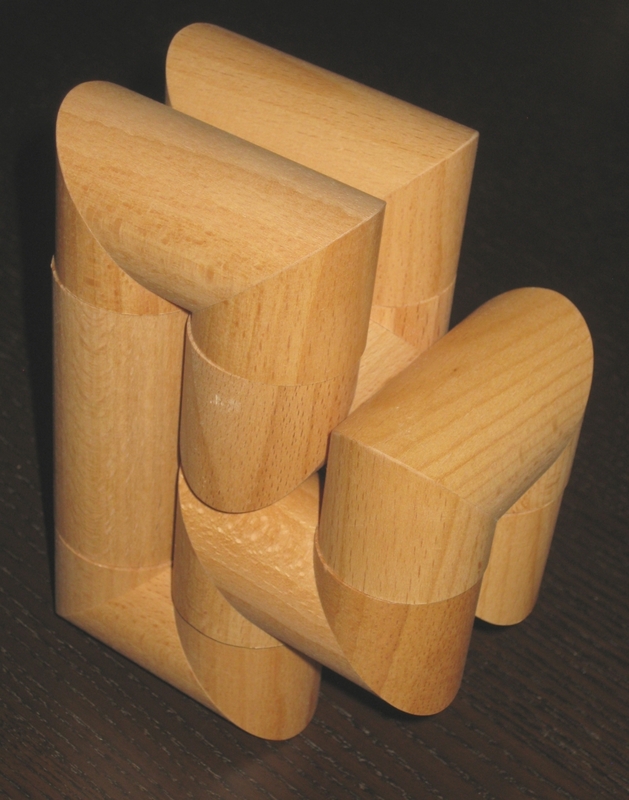 Interestingly, at the at same time as George designed this puzzle, Don Charnley also designed the same puzzle, and named it Donz Q'b. The interesting thing is that the puzzles pieces are mirror images of each other. 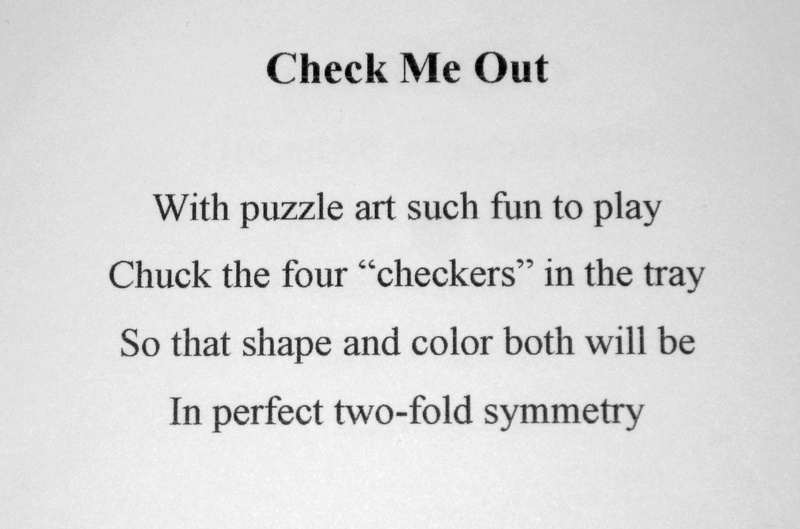 So you may find this puzzle referred to by either name, but in the end it's the same puzzle. I've deliberately, not included the picture of the solved shape as part of the gallery since that's part of the challenge, but since it's readily available in a number of places on the web, if you want to see it, click on the image above to see the full shape. Overall, a fun puzzle, and highly recommended if you can get a copy.